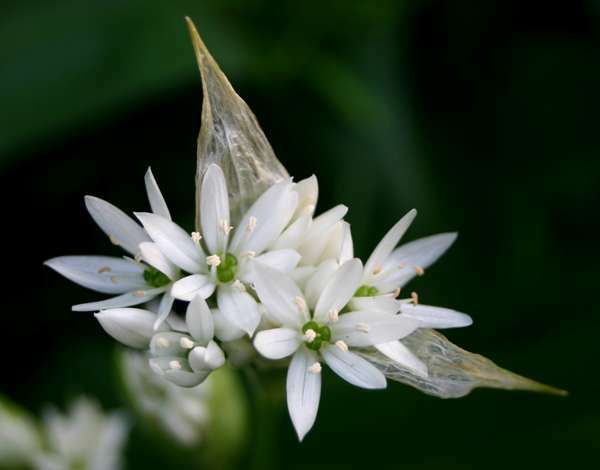 Ramsons, or Wild Garlic as it is sometimes (correctly) called, advertises its presence by its very strong odour, especially if stems are crushed. Plants of Ramsons typically have two or three leaves up to 4cm wide and 30cm long. Bulbs form from the base of a leaf stalk. Umbels of garlic-scented white flowers produce capsules that contain the seeds, but reproduction is mainly vegetative rather than via the seeds. The flowers, 1.5 to 2cm across, are star-like and have six white tepals (three petals and three sepals), and they have stamens shorter than the perianth. The triangular-section stems and strong garlic-like odour are helpful features distinguishing young Ramsons plants from those of the seriously poisonous Lily-of-the-Valley. 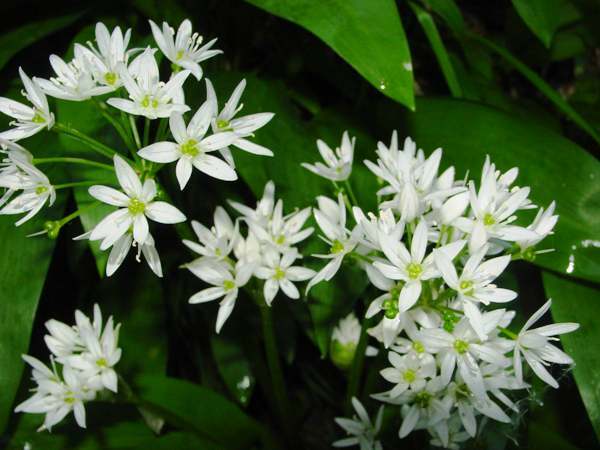 Allium ursinum is common and widespread throughout Britain and Ireland as well as on mainland central and northern Europe. It is recorded also from parts of Asia. 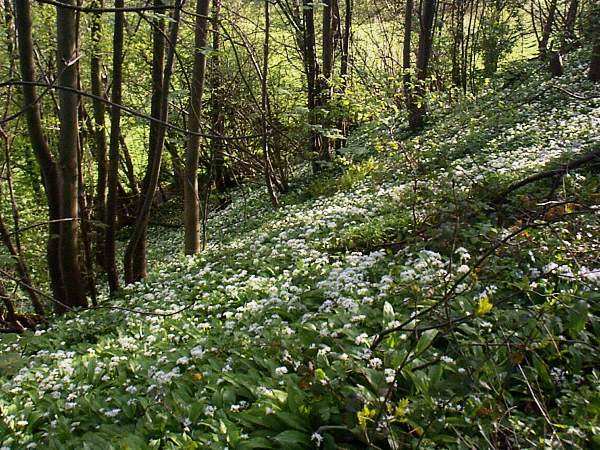 Ramsons carpets woodland floors and roadside verges in damp shady places. The first few flowers may appear towards the end of March or in early April, but May and early June are when this striking wildflower is at its best in Britain. 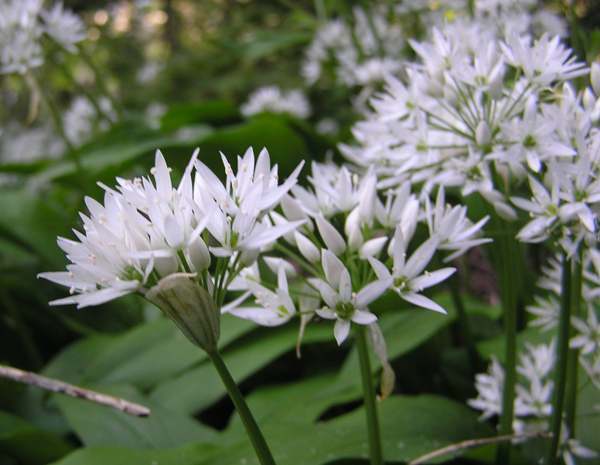 Ramsons, a relative of the cultivated Leek, is an edible plant and has been used in cooking for hundreds of years. It has a more delicate flavour than the garlic cloves with which we are more familiar. Whether Ramsons deters vampires is uncertain, but Ramsons certainly exists! Allium is the Latin word for garlic, while the specific epithet ursinum refers to a bear (just as Ursa Major = The Great Bear, a star constellation). Brown Bears are reported to enjoy eating the bulbs of Ramsons - and there are still places where you could see bears and Ramsons together in the forests of some parts of mainland Europe! The Ramsons plants shown on this page were photographed in spring in West Wales, where many roadsides and woodlands are carpeted by these invasive wildflowers.